Welcome to Marvel Strike Force Minions page. This is the full description of MSF Hand Archer stats, skills, and abilities. In Marvel Strike Force, Hand Archer is a Hand minion with decent damage output who removes buffs from enemy targets. The HAND is a supervillain organization made up of evil mystic Ninjas who uses organized crime, mercenary activities and assassination plots in their search for power. The Hand’s home base is primarily in Japan but Hand conducts actions all around the world. The Hand was founded in 16th century by Japanese nationalist Samurai, but the organization was soon overtaken by Snakeroot, an ancient Ninja clan who worship an ancient evil demon known as “the Beast of the Hand”. 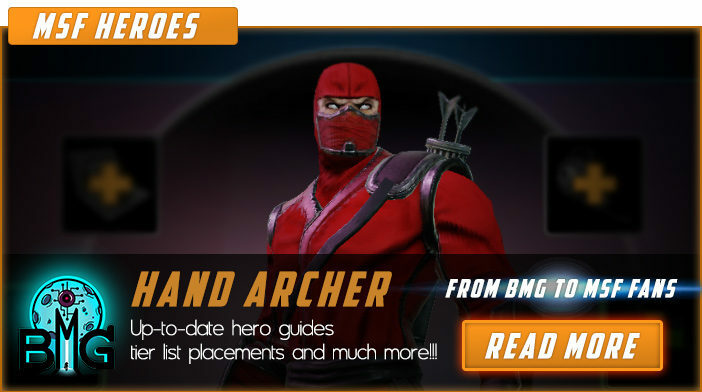 Hand Archer is obtainable through premium orbs, violent vigilante orbs, and arena store and his price is 15 orbs. Hand Archer's main strength is his ability to hit all enemies and remove positive effects from each enemy. Hand Archer has mediocre stats but he has very good base damage and 5% dodge chance. This character can be summoned by Nobu. Hand Archer is a deadly archer who can clear effects off the enemy team. We hope that you enjoyed the description of MSF Minion Hand Archer. For detailed information about other MSF Characters check our MSF Minions page. You can play MARVEL Strike Force on PC. By using this link you will support BlueMoonGame. If you are new, check out our BlueStacks guide.